Fethiye is located on the Lycian and Carian border and was called Telmessos in ancient times. The city was very prominent and a centre of prophecy, pledged to Apollon. That the city life was rich and highly cultured during the Hellenistic and Roman periods is evident from the existing monuments. Today the majority of ancient ruins in Telmessos are rock-tombs, Lycian-type sarcophagi, the fortress and the Roman Theatre. The peninsula lying between Fethiye and Antalya was known as Lycia in the ancient times. Lycians were natives of Anatolia and sea-faring people as mentioned in Homer’s Iliad and Kadesh War Peace Agreement document. 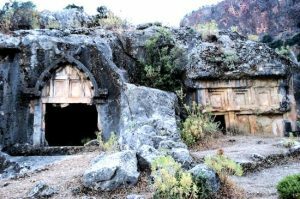 The tomb of Amyntas, which could be considered as the insignia of Fethiye, strikes the eye with its grandeur on the slope as you enter the bay. This tomb, whose façade was built as an Ionic temple based on the plan of in antis, belonged to Amyntas is believed to be a king or a governor of Telmessos during the Hellenistic period. 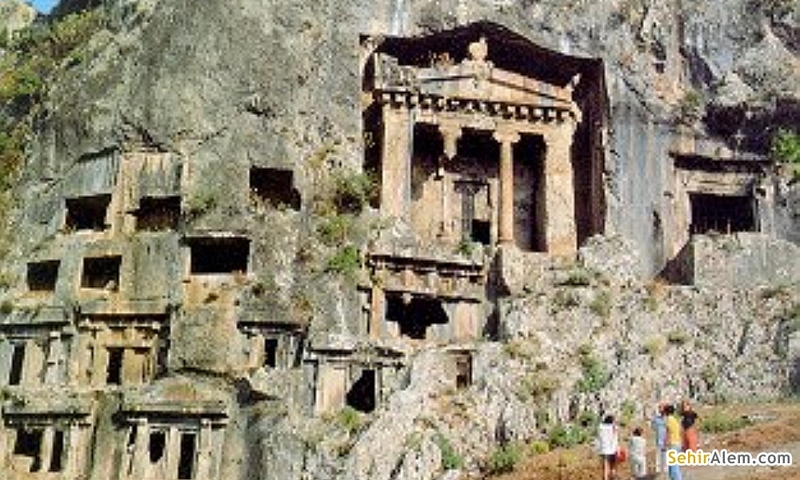 Within the city there are quite a number of Lycian-type sarcophagi. On these there are epitaphs in the Lycian scripture. Especially the sarcophagus near the government house is worthy of notice, with its relieves depicting warriors. The fortress stands where the city was first founded and the existing walls are from the 11th Century. At same places, portions of walls from the Roman period can be seen. The fortress was repaired by the Rhodesian Knights during the 15th Century and was used as a naval base. Telmessos Ancient Theatre stands opposite to the commercial quay at Fethiye town centre. Typical Roman type theatre was built in 2nd. Century on the remains of a Greek style previous one. The site was escavated by the Fethiye Archaeology Museum in 1993 and a restoration project was made to renovate the theatre’s cavea and stage. Fethiye Archaeology Museum exhibits numerous Archaeological findings from the Lycian, Hellenistic, Roman and Ottoman periods as well as ethnological works of art typical of the region. There is a new project to be realised in 2001—2002 for a new “open-air Museum complex with the ancient theatre”. Fethiye Municipality and the Directory of Museum are leading this project to reform the centre of town with the idea of protecting natural and cultural environments of Fethiye. The Teke Peninsula of our times, lying between Fethiye and Antalya was known as LYCIA in the ancient times. In fact the Lycians participated in the Kadesh War together with Hittites, Which indicates that they were one of the oldest tribes of Anatolia. All through the history, Lycia was invaded by the Persians, Alexander The Great, Romans and Byzantines but was never evacuated. Fethiye is an appropriate centre for excursions into Lycia. Either on your own or by organised daily tours, you can pay visits to major Lycian cities in the region. Explore Blue Lagoon (Ölüdeniz) where the calm crystal water is ideal for swimming and other water sports. Blue Lagoon is located near the famous tourist resort of Fethiye, Belcekız Beach and protected as one of the natural parks of Turkey. Political capital of Lycian Federation, Xanthos is known as the place of people who committed suicide all together for peace and freedom when Persians invaded town in 546 BC. Sir Charles Fellows first discovered Xanthos in 1838 and all relieves and unlikely beautiful Nereid’s Monuments were carried to London—British Museum. The ruins still standing in the city, which is at present location of Kınık Village on the road from Fethiye to Kaş Town, are splendid samples of the Lycian Civilisation. 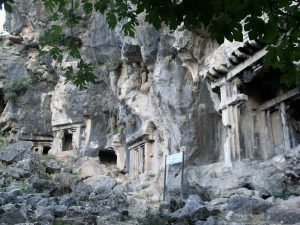 The ancient city of Cadianda is located at Üzümlü Village, about 20 Km. from Fethiye. Best samples of Cyclops Walls of the ancient ages, a sport complex, theatre and Heroon like temple type tombs are all worth to see. Tlos: Located at 28 km. from Fethiye, Tlos is one of the oldest residential areas of Lycia and one of the few cities, which continued its existence up to the 19th Century. Tlos is known as “the sport centre” of Lycian Federation and was the home of mythological winged horse Pegasus and his hero Bellorophonte. Acropolis, temple type tomb of Bellorophonte, Stadium—bath complex, and theatre are some of the structures coming from early periods of Tlos. 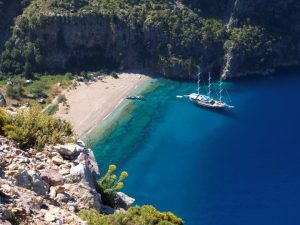 “Beauty Center” of Lycians, Pınara is on the way to Minare Village and can be reached by a short road branching off from the Fethiye—Kaş highway. Numerous Pigeon Holes like simple tombs carved on the slope of the Hill and a hearth planned Aphrodite Temple are probably the most interesting remains of Pınara to see. Letoon is a holy city, dedicated to Goddess Leto, located at the Kumluova Village and 4 Km. from Xanthos. 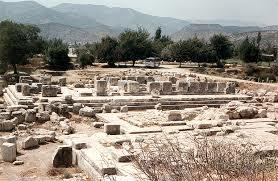 It is known that all holy ceremonies were held here with the priests of the temples of Leto, Artemis and Apollon. recently excavated city of Oenanda is located near İncealiler Village, about 88 Km. to Fethiye. British and Turkish archaeologists discovered about 300 scribed tablets of Lycian Epicurean Philosopher Dioghenes. Fethiye is surrounded by Toros (Taurus) Mountains, which are fully decorated with pine and cedar trees in addition to about 10.000 sorts of floral components. Ecological life of Fethiye is waiting to be explored by the people who are the lovers of nature, culture and history. Pieri Rapos, Euglapia Quadripunctia, Danaus Chtsippus and others… Butterfly Valley is placed at the bottom of deep and sharp of a Valley, which is one of the most beautiful bays around Fethiye. Starting springtime for about 9—10 months more than 40 kinds of butterflies can be watched in the valley. Following the road leading from Kaya Köyü, you end up at a beautiful beach surrounded by pine and olive trees. Gemiler bay is facing you to the small Island where Byzantine ruins lie tucked among the pines. A Japanese team has carried on archaeological excavations for 10 years. This site is also operated as a camp-site by the Directorate of National Parks and renewed for its incense (Sytrax) trees (Liquidi-Ambar Orientalis) which grow only in Muğla region. The Muğla—Fethiye highway branches off to this campsite at a point 15 km. from Fethiye and there are numerous little bays around this spot. Katrancı is an ideal place with camping facilities where pine trees stretching right to the shore. High in the mountains above Fethiye rushing torrents cut a narrow gorge / canyon through the mountains, creating Saklıkent Gorge. A cool refuge on hot summer days, Saklıkent Gorge is a favourite picnic spot with rustic restaurants serving delectable fresh trout. The Gebeler Spa is a thermal spring recalling Tlos baths. The spring, that content high Chlorine and sulphate cures many ailments. The 15 meters deep hot water wells are most efficacious remedies for rheumatism, sciatica and skin diseases. Beyond the Fethiye fortress going south, if you follow the road climbing up to the slope some 7 km. you can come to a magnificent lowland where Anatolian Greeks had lived until 1922. Greeks called the town Levissi in the past. Kaya Köyü in the year 1922 during the exchange of Turks in Thrace with Anatolian Greeks was evacuated and the new residents did not take up the existing houses. Kaya become a “Ghost Town” as an abandoned town after 1923. 2 churches, chapels, numerous houses, schools, library, hospital, work—shops and the other structures will be renovated soon according to a project which is made by The Association of Turkish Travel Agencies and The Chamber Of Turkish Architects. After the renovation, Kaya Köyü will serve as the place of “ Piece & Friendship Village” and be protected forever. Fethiye’s magnificent mountains and forests are mostly undeveloped, existing as wonderful natural preserves for an extraordinary variety of life a culture, flora and fauna. For centuries nomads and semi—nomadic people have migrated annually to the fresh pastures of the higher elevations in summer. Seki and Girdev Pastures are two of magnificent picturesque areas on Taurus (Toros) Mountains about 80 km. to Fethiye Town centre and famed for their horses and Juniper trees. At Boğalar Village, there is a nomad museum worth seeing, immortalising the traces of culture at pastures.